From the ERM Yale website. 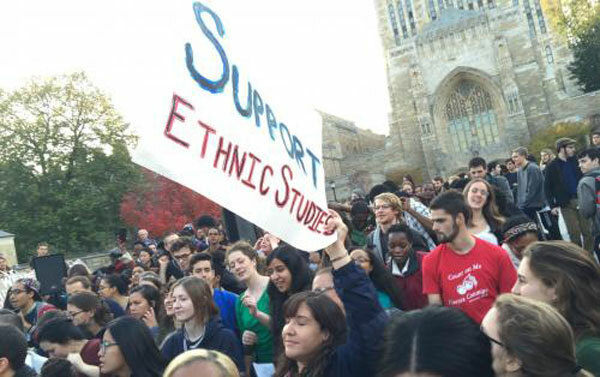 On Friday, Yale University received 13 individual letters from senior faculty members announcing that each would be withdrawing services to the Ethnicity, Race & Migration program at the university because the university had been systematically underinvesting in the program and refusing to provide it hiring power, participation in the promotion process, and a sense of clarity around its own basic resources even as it was growing. The withdrawals leave the program without tenured faculty and with a public ultimatum in need of response. Reportedly, the faculty have been unhappy with Yale’s evident disinterest in the program since 2002 and have been expressing that to the administration which has made and broken promises repeatedly. Meanwhile, a student action group recently organized under the name Coalition for Ethnic Studies and Faculty Diversity has also made ER&M’s lack of departmental status an issue. All see the lack of recognition of this program as part of a larger problem. Yale’s inconsistent support for the study of Ethnicity, Race, and Migration is alarming given the multitude of critical issues our teaching and scholarship engage in this moment: The rise of white nationalism, a refugee crises across three continents, climate migration, and pressing matters related to immigration and detention, voting rights, policing and incarceration, and racial violence. Even as the university has failed to support the program, student interest in ER&M classes has increased tremendously, according to Camacho, current chair of ER&M. HoSang says what has resulted is a program that “has essentially been sustained by voluntary labor for the past 20 years.” He says that the administration essentially treats ER&M as an “extracurricular.” HoSang himself said he moved across the country to take a dual appointment to the ER&M program and to the American Studies Department, only to discover later that his appointment was only with American Studies. He says he knows of at least four other faculty who have experienced the same dynamic. The press release announcing the faculty action says that the university administration under two presidents, Richard Levin and current president Peter Salovey, committed to change the status and funding of the ER&M program in 2011, 2015, and 2016—but that, along with other promises, has gone unfulfilled. However, the program’s state of limbo did not emerge from a vacuum. In 2015, Yale pledged $50 million toward faculty diversification as part of the Faculty Excellence and Diversity Initiative. Students and faculty are now questioning where all that money went, given the clearly documented and longstanding issues of this marginalized program. The professors met as a group on Friday with Tamar Gendler, Dean of Arts and Sciences, whose statement indicates that she may understand the time for inaction has passed.